Puchov/Hanover, February 21, 2019. 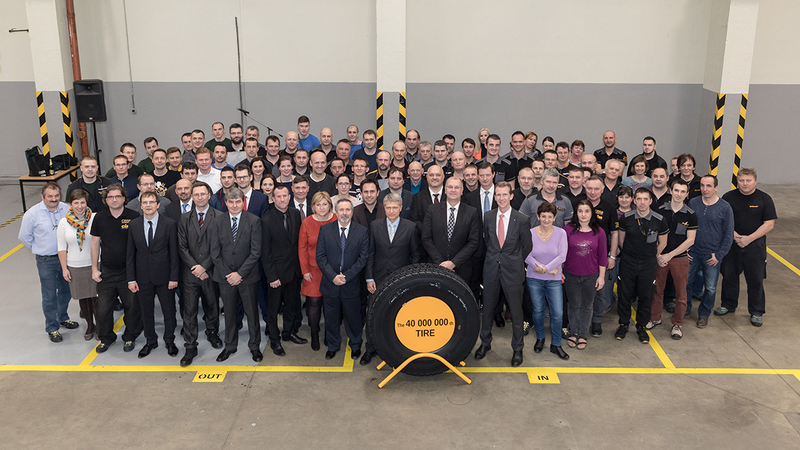 The technology company and premium tire manufacturer Continental celebrated on Monday, February 18th at its location in Puchov, Slovakia the production of 40,000,000 truck tires since 1999 when Continental took over the truck tire operations. Continental manufactures at its Puchov facilities passenger, truck and bustires, conveyor belts and currently employs 4,530 employees. The jubilee intelligent tire 315/80 R 22.5 Conti Hybrid HD3, equipped with the ContiPressureCheck sensor, was produced in the truck tire plant on 13th February 2019. To commemorate this important day, the jubilee tire was signed by Patrick Haarmann, Head of Manufacturing Truck Tires, Constantin Batsch, Head of Business Region Truck Tires EMEA Replacement, and Ladislav Rosina, Plant Manager of Continental Matador Truck Tires s.r.o..
Continental is present in Slovakia with both Automotive and Rubber Group in the cities of Puchov, Zvolen and Dolne Vestenice. Continental manufactures at its facilities in Puchov the tires for passenger cars, light trucks, trucks, trailors, and buses, as well as conveyor belts. Various group brands are produced here, among which: Continental, Matador, Semperit, Barum, Uniroyal, Viking, Gislaved and many others. Continental Puchov currently employs 4 530 employees.